Overview - One of the most powerful of the family portraits by Yasujiro Ozu, Late Spring tells the story of a widowed father who feels compelled to marry off his beloved only daughter. Eminent Ozu players Chishu Ryu and Setsuko Hara command this poignant tale of love and loss in postwar Japan, which remains as potent today as ever—and as strong a justification for its maker’s inclusion in the pantheon of cinema’s greatest directors. At some point, whether we want it to or not, the rippling current of change comes for us all. Its impetus can surge from a variety of sources, both internal and external, and though many often successfully resist, sometimes the push is simply too great. In Yosujiro Ozu's 'Late Spring,' this call toward change comes in the form of familial and societal pressures, which bear down upon one young woman, urging her toward a transition she continually refuses to embrace. Both joyful and devastatingly poignant, the film weaves an insightful tale of family and growth that is made all the more resonant thanks to Ozu's refreshingly modest, yet meticulously deliberate style. Set in postwar Japan, the story follows a widowed father, Shukichi (Chishû Ryû), and his twenty seven year old daughter, Noriko (Setsuko Hara). Though both are seemingly content in their uncomplicated life together, Shukichi comes to believe that it is time for Noriko to find a husband. Reluctant to leave her father to start a life of her own, the young woman repeatedly resists attempts to be paired off. After all, she is perfectly happy as she is, and enjoys taking care of Shukichi. Eventually, the drama comes to a head as father and daughter are forced to make heavy choices that will forever alter the dynamic of their relationship. On the surface the plot seems quite simple, and indeed the narrative structure of the film is just that. Most of the movie is made up of straightforward conversations, and observations of the main characters' daily lives. As ordinary as it all may appear, the universal themes prove to be infinitely deep and richly textured. This is a film full of truly profound insights that are all made in a humble, understated manner, giving the story a kind of gentle realism that tackles the melancholy toll of progress. As bittersweet as the whole affair can get, Ozu actually injects a wonderfully playful sense of humor throughout the proceedings, giving equal weight to the drama's joys and sorrows. Throughout all of the ups and downs, the narrative lacks sensationalism, instead evoking the more moderate tempo of actual life. Perfectly contemplating the story's naturalistic sensibilities, is Ozu's unassuming but carefully measured cinematic style. The director is famous for his trademark use of low angle static shots, and while there are a few tracks here and there, that's exactly how the majority of 'Late Spring' is filmed. By keeping his camera stationary and near to the ground, the director engenders a sense of stripped-down intimacy that doesn't call attention to itself. The style is both personal and distant at the same time, with the audience often made to feel like unseen guests watching the characters' lives. The framing frequently allows us to see all that we need to see, with cuts to new shots mostly occurring as mere segues from room to room as characters move about. In between and even during some scenes, Ozu regularly transitions to shots of nature or empty rooms, extending the serene mood through lyrically timed cutaways dubbed "pillow shots." With all that said, traditional close-ups and coverage are indeed used to bolster important moments, revealing little nuances in performance, lending great weight to every facial expression. Speaking of facial expressions, Noriko sure does like to smile. Actually, she loves to smile. In fact, for the first half of the film she essentially wears a perpetual smile on her face. She even smiles when she probably shouldn't, like when she rather harshly critiques an older man for remarrying. Her smile is so constant, seemingly sincere, periodically inappropriate, and absolutely infectious that it eventually becomes disarming, making it hard to get a true reading on the character. 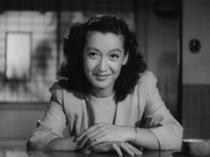 At first glance, this might make Setsuko Hara's performance seem one-note, exaggerated, or even unrealistic, but upon closer inspection this couldn't be further from the truth. The actress brings a great level of depth to the role, hiding layers of emotional subtext beneath each masking grin and smirk. When her smile does finally fade, the sharp contrast to what came before makes the tonal shift all the more distressing and impactful. Chishû Ryû turns in a similarly deceptive performance. For the majority of the running time his character lends the film a likeable but fairly innocuous presence. This gradually changes, however, as the actor's genius sort of sneaks up on the audience. A third act heart to heart between father and daughter focusing on the nature of happiness is particularly moving, and Ryû's simple, matter-of-fact demeanor gives the scene a surprising amount of power. The shifting relationship between the two characters is the core of the story, and their deep yet potentially drifting bond is perfectly realized by both actors. While Noriko is the central figure for the majority of the running time, as pointed out in the commentary, the film's closing scenes end up transferring the focus onto Shukichi, and what Ryû is able to evoke in those last few sequences is nothing short of masterful. As the film's final images hit the screen, the full extent of the actor's performance is finally made clear -- and it's utterly heartbreaking. 'Late Spring' is a quietly beautiful film. 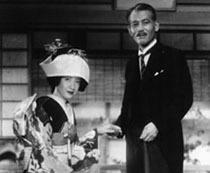 Ozu's style is restrained but sophisticated, letting calculated simplicity reveal truth. Everything, from the naturalistic performances to the very stillness of the camera, is used to convey an effortless air of transparency and verisimilitude. There is just something indescribably pure about the director's work, an earnest passion and sincerity in his actual visual form that far too many contemporary efforts lack. There is a rare level of authenticity in the images and themes, ultimately forming a powerful, bittersweet story about family and change. Whether or not that change proves to be necessary, lasting, or even positive, is left up to interpretation, but as Ozu so concisely reveals, forced or chosen, growth is simply an inherent function of society and nature. We just can't hide from it. Flowers bloom and winter becomes spring and the tides come in, and eventually, all fathers have to say goodbye to their daughters. Criterion presents 'Late Spring' in their standard clear case with spine number 331. The BD-50 region A disc comes packaged with a booklet featuring essays by critic Michael Atkinson, and historian Donald Richie, along with Ozu's comments on frequent collaborator Kogo Noda. The movie is provided with a 1080p/AVC MPEG-4 transfer in the 1.33:1 aspect ratio. Ozu's visual style carries an undeniable beauty, and while the transfer does a nice job of showing off the impressive cinematography, there is an unfortunate amount of damage visible in the print. The source is in decent shape with a light layer of grain, but various signs of age and wear show up consistently throughout. Specks, tears, scratches and frequent vertical lines are visible on a regular basis to varying degrees. The opening titles and a later scene set in a bar are the worst, with so many streaking lines and tears that they almost look like falling rain. Thankfully, extreme cases like that are rare and most of the damage is not overly bothersome. Contrast fluctuations and slight stability issues are also prevalent, causing some periodic pulsing, shaking, and blurring of the image. With all that said, though there are some rough patches here and there, the majority of the film looks pretty good (even great at times) and the damage certainly doesn't ruin the presentation. Clarity is actually very strong, revealing a nice amount of fine detail and texture in objects, clothing, and faces. The picture has a nice sense of depth as well, giving Ozu's carefully framed compositions a pleasing level of dimension. Whites favor a slightly blown out look and black levels are mostly deep, but the aforementioned fluctuations can cause them to appear elevated at times. 'Late Spring' is a skillfully shot film, but this transfer is a bit of a mixed bag. Though understandable, the damage and stability issues can be a little distracting at times. Thankfully, the various strengths of the image far outweigh the print's weaknesses. It's not perfect, but this is probably the best the film could look given the elements available. The movie is presented with a Japanese PCM mono track along with English subtitles. Featuring a beautiful score and some subtle design work, this is a solid mix. Dialogue is clean throughout but sounds a little thin, as is frequently the case with films of this age. The bittersweet score by Senji Ito perfectly complements the images, but certain cues do exhibit a strained quality, revealing the inherent limitations of the source recording. Effects work is sparse, but key design choices come through well when called for. Unfortunately, there is a fairly persistent background hiss audible in the track, but I didn't really find it to be much of a distraction. There are some age related issues, but for all intents and purposes, 'Late Spring' sounds exactly like it should. Audio Commentary by Richard Pena - Film professor Richard Pena provides a steady and very informative discussion of the film. 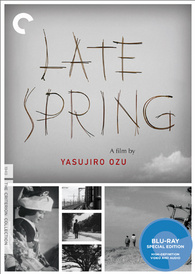 Analysis of Ozu's visuals, themes, plot structure and characters are provided along with details on how 'Late Spring' fits into the director's larger filmography and Japan's shifting culture. With a wealth of interesting observations and insights shared throughout, this is well worth a listen. Tokyo-ga (HD, 1 hr & 32 min) - Presented in 1080i this is a feature length documentary about Yosujiro Ozu from acclaimed German filmmaker Wim Wenders. More akin to an experimental video essay than a traditional doc, the film features a rather calm and soothing voice over narration from Wenders as he travels to Japan in order to better understand the essence of Ozu's films. While we're treated to lots of fly-on-the-wall footage of subway stations, Pachinko parlors, and various other seemingly banal aspects of life in Tokyo, Wenders offers numerous philosophical observations on Japanese culture and the nature of cinema itself. Though some of these segments can get a bit ponderous, I actually found one extended sequence detailing the creation of wax food displays to be bizarrely fascinating. In many ways, the doc reminded me of Chris Marker's 'Sans Soleil,' (Marker even makes a brief cameo appearance). While the film's connection to Ozu himself can seem a bit tangential at times, interviews with actor Chishû Ryû and cinematographer Yûharu Atsutaa end up offering some great insights into the famed director's style and creative process. Atsutaa's interview is particularly moving as he actually breaks down toward the end, clearly missing his departed friend. Though the more experimental nature of the doc won't be for everyone, this is an artful, full-fledged film in its own right and a great inclusion from Criterion. 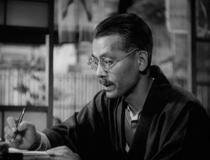 Yasujiro Ozu's 'Late Spring' is a film of quiet beauty. Through lyrical simplicity, the director reveals the bittersweet cost of progress. An ambiguous commentary on shifting family structures and evolving Japanese culture, the movie continues to hold great emotional resonance. Though there are some noticeable signs of age and damage, the video transfer is respectable. The audio is clearly a product of its time, but remains perfectly serviceable. Though supplements are pretty slim, with only a documentary and commentary, both extras prove to be well worth your time. This is a great film and a solid disc from Criterion. Highly recommended.